This doctrine is extraordinarily controversial. Some Catholic extremists claim (contrary to further Church teaching, including a further infallible definition) that this means everyone who is not a full-fledged, professing Catholic is damned. Non-Catholics find the claim offensive, sectarian, and anti-Christian in sentiment. Most Catholics who are aware of the definition find it embarrassing, especially in today’s ecumenical age, and many try to ignore or dismiss it, though even liberal Catholic theologians admit it is a genuine doctrinal definition and must in some sense be true. Its truth was reinforced by Vatican II, which stated: “This holy Council . . . [b]asing itself on Scripture and Tradition . . . teaches that the Church, a pilgrim now on earth, is necessary for salvation. . . . [Christ] himself explicitly asserted the necessity of faith and baptism (cf. Mark 16:16, John 3:5), and thereby affirmed at the same time the necessity of the Church which men enter through baptism as through a door. Hence they could not be saved who, knowing the Catholic Church was founded as necessary by God through Christ, would refuse either to enter it or to remain in it” (Lumen Gentium 14). Many moderns explain this doctrine in a way that robs it of its content. In the 1950 encyclical Humani Generis, Pope Pius XII, who admitted the possibility of salvation for non-Catholics, lamented that some Catholic theologians were “reducs an exclusivist view of salvation, this teaching does not mean that anyone who is not a full-fledged Catholic is damned. As further Church teaching has made clear, including a further doctrinal definition, it is entirely possible for a person to be saved without being a professing Catholic. Formally belonging to the Church and formally being subject to the Roman Pontiff are normative rather than absolute necessities. An absolute necessity is a necessity which holds in all cases with no exceptions. A normative necessity is usually required, though there are exceptions. An example of normative necessity in everyday American life is the practice of driving on the right hand side of the road. This is normally required, but there are exceptions, such as emergency situations. For example, if a small child darts out from behind parked cars, it may be necessary (and legally permitted) to swerve into the left hand lane to avoid hitting him. Thus the necessity of driving on the right hand side of the road is a normative rather than an absolute necessity. Whether it is a normative or an absolute necessity to be united to the Catholic Church depends on what kind of unity with the Church one has in mind, because there are different ways of being associated with the Catholic Church. “Fully incorporated into the society of the Church are those who, possessing the Spirit of Christ, accept all the means of salvation given to the Church together with her entire organization, and who — by the bonds constituted by the profession of faith, the sacraments, ecclesiastical government, and communion — are joined in the visible structure of the Church of Christ, who rules her through the Supreme Pontiff and the bishops” (Lumen Gentium 14, Catechism of the Catholic Church 837). But it is also possible to be “associated” with or “partially incorporated” into the Catholic Church without being a fully and formally incorporated into it. Vatican II states: “The Church knows that she is joined in many ways to the baptized who are honored by the name of Christian, but do not profess the Catholic faith in its entirety or have not preserved unity or communion under the successor of Peter” (Lumen Gentium 15). Those “who believe in Christ and have been properly baptized are put in a certain, although imperfect, communion with the Catholic Church” (Unitatis Redintegratio 3; CCC 838). Those who have not been baptized are also put in an imperfect communion with the Church, even if they do not realize it, if they possess the virtues of faith, hope, and charity. Pope Pius XII explains that the “juridical bonds [of the Church] in themselves far surpass those of any other human society, however exalted; and yet another principle of union must be added to them in those three virtues, Christian faith, hope, and charity, which link us so closely to each other and to God. . . . [I]f the bonds of faith and hope, which bind us to our Redeemer in his Mystical Body are weighty and important, those of charity are certainly no less so. . . . Charity . . . more than any other virtue binds us closely to Christ” (Mystici Corporis 70, 73). Understanding this distinction between perfect and imperfect communion with the Church is essential to understanding the necessity of being a Catholic. It is an absolute necessity — no exceptions at all — to be joined to the Church in some manner, at least through the virtues of faith, hope, and charity. However, it is only normatively necessary to be fully incorporated into or in perfect communion with the Catholic Church. There are exceptions to that requirement, as the Council of Trent taught (see below), though it is still a normative necessary. Theologians also differentiate between things that are necessary by precept and things that are necessary as a means. The same example of driving on the right hand side of the road serves to illustrate both. In America driving on the right hand side of the road has a necessity of precept because the law requires us to do so. However, it is also necessary as a means because if one wishes to safely navigate the highways in America then one must drive on the right hand side of the road. If you wish to arrive safely at your destination, the means to that end is driving on the right hand side. Thus driving on the right side of the road is a normative necessity by precept (because the law normally requires it) and a normative necessity of means (because it is normally necessary to safely arrive at one’s destination). However, it is not an absolute necessity of precept (because the law makes exceptions for emergencies) or an absolute necessity of means (because safely arriving at one’s destination sometimes requires a swerve into the other lane as an emergency maneuver). When it comes to the question of being a Catholic, that is both a necessity of precept and a necessity of means. It is a necessity of precept because God commands it, for “the Catholic Church was founded as necessary by God through Christ,” Lumen Gentium 14 (CCC 846). It is a necessity of means because the Catholic Church is the sacrament of salvation for mankind, containing all the means of grace. 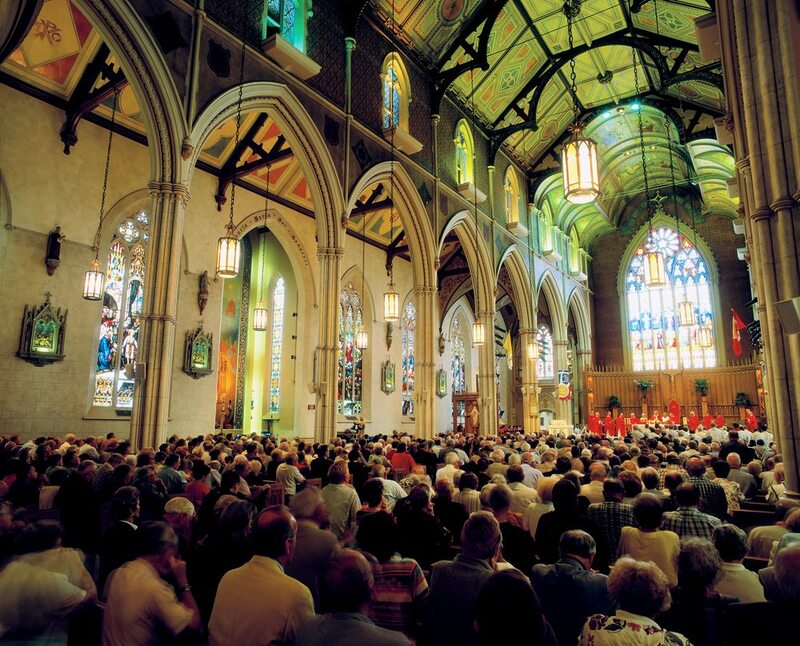 “As sacrament, the Church is Christ’s instrument. ‘She is taken up by him also as the instrument for the salvation of all,’ ‘the universal sacrament of salvation,’ by which Christ is ‘at once manifesting and actualizing the mystery of God’s love for men'” (CCC 776, citing Vatican II’s Lumen Gentium 9:2, 48:2, and Gaudiam et Spes 45:1). To many this teaching sounds extremely offensive, sectarian, and anti-Christian. But is it really? While non-Catholic Christians balk at the claim one must be a Catholic to be saved, many do not balk when it is said that one must be a Christian to be saved. Evangelicals and Fundamentalists are well known for claiming precisely this. Many even say it is an absolute necessity — no exceptions allowed — and are critical of Catholics for saying some non-Christians may make it into heaven. They claim that in allowing this possibility the Church has compromised the gospel. Evangelicals and Fundamentalists find the claim that one must be Catholic to be saved offensive, but no more offensive than non-Christians find the Evangelical claim that one must be Christian to be saved. Non-Christians regularly complain that this claim is offensive, sectarian, and even “anti-Christian.” Yet Protestants argue that it is nothing of the sort; it is simply true. One must (at least normatively) be a Christian to be saved. To back this up, they point to verses such as John 14:6 and Acts 4:11-12. In the former, Jesus declares, “I am the way, and the truth, and the life; no one comes to the Father, but by me.” In the latter Peter declares that Jesus is “the stone which was rejected by you builders, but which has become the head of the corner. And there is salvation in no one else, for there is no other name under heaven given among men by which we must be saved.” Both passages teach the (normative) necessity of being a Christian to be saved, and Protestants are right to cite them. This means the Catholic claim that we must be part of a particular group is no more offensive, sectarian, or anti-Christian than the corresponding Protestant claim. It simply involves a somewhat smaller group — Catholics — instead of a somewhat larger one — Christians (the majority of whom are Catholics to begin with). It is part of the offense of the gospel, since the gospel demands a radical commitment to Christ (and correspondingly to his Church). Non-Christians naturally find this call to a radical realignment and recommitment upsetting, but there is nothing unreasonable about it. It is part of the offense of the gospel. Similarly, there is no unreasonableness about the gospel’s demand for a commitment to Christ entails a corresponding commitment to his Church. When they find this offensive, Evangelicals and Fundamentalists are having the same emotional reaction that others have to their own claim. This has nothing to do with whether the claim is true; it is simply part of the offense of the gospel. How then would a Catholic go about proving it is necessary to be a Catholic and subject to the pope? The answer is that both these things are refinements of what it means to be a Christian. To be a Christian it is normatively necessary to be a formal member of the Church Christ founded. This is the Catholic Church. And to be a formal member of the Catholic Church it is necessary to be formally subject to the earthly leader Christ established for it: the pope. 1) To be saved it is necessary to be a Christian. 2) To be a Christian it is necessary to be a member of Christ’s Church. 3) To be a member of Christ’s Church it is necessary to be a member of the Catholic Church. 4) To be a member of the Catholic Church it is necessary to be subject to the Roman Pontiff. 5) Therefore, it is necessary for salvation to be subject to the Roman Pontiff. In this argument, the necessities are all normative necessities and the kind of membership being discussed is formal membership. The argument has a logically valid form (in fact, it expresses a variation on what is known as the “hypothetical syllogism” argument form), meaning that the truth of its conclusion depends only on the truth of the premises it contains. The first premise we may take as established. The verses quoted earlier, John 14:6 and Acts 4:11-12, show that it is (normatively) necessary to be a Christian to be saved. Both Protestants and Catholics also agree on the second premise, though they disagree over the nature of Christ’s Church. Protestants say it is necessary to be a member of Christ’s Church to be a Christian because in their view all true Christians are automatically members of Christ’s Church, which they define as the invisible, spiritual communion of all true Christians. Catholics say that it is normatively necessary for Christians to be members of Christ’s Church for two reasons. First, because baptism automatically incorporates one into the Catholic Church (Rom. 6:3, Gal. 3:27) unless some assault on the unity of the Church — such as heresy or schism — prevents one from being or remaining fully incorporated into it (cf. Rom. 11:19-23, Col. 2:18-19). Because baptism is the means by which one becomes a Christian, there is a necessity of means for a Christian to be a Catholic. Second, because Christ also commands his followers to be subject to the Church leaders he has established (including the pope). This means it is also a necessity of precept for a Christian to be a member of the Catholic Church (1 Thess. 5:12-13, Heb. 13:7, 17; cf. Matt. 16:18, Luke 10:16, Acts 20:28). When a Protestant objects to the above argument, it will be to the third proposition — that the Catholic Church is the Church Christ founded. Both sides agree on the other three points. While it is beyond the scope of this article to give a full proof of the third proposition (this is one of the major tasks of Catholic apologetics), we can offer a limited proof. Both Protestants and Catholics agree that Christ founded some Church and that this Church will remain forever (Matt. 16:18). The question is whether this Church is a visible communion that can be identified or whether is it a purely spiritual communion made up of all the saved. If it is a visible communion, the Catholic Church is the only plausible candidate, since only this Church extends back far enough (the Eastern Orthodox communion did not finally break with Rome until the 1450s, a mere sixty years before the Protestant Reformation). We can thus give a limited argument for the third proposition by showing the Church Christ founded is a visible communion. This is proven in Matthew 16:17-19, the passage in which Christ promised the gates of hell would never prevail against his Church (meaning that it would always exist). Several factors in the text show he was talking about a visible communion. Second, Jesus gave Peter the keys to the kingdom of heaven (Matt. 16:19), which are for use in Church government (compare Isa. 22:22 — the only Old Testament parallel to this verse). But one cannot govern an invisible communion of believers, only a visible one. Third, Jesus gave Peter the power of binding and loosing (Matt. 16:19), which Matthew 18:17-18 indicates is used in Church discipline. But one cannot exercise Church discipline over an invisible body. Indeed, Matt. 18:17-18 refers it to public excommunication, in which an individual is treated by the church as “a gentile or a tax collector” (that is, as an unbeliever). Fourth, Jesus explicitly stated that Peter would exercise the power of binding and loosing on earth. This shows his authority is an earthly one, over an earthly Church. Fifth, Jesus promised the gates of hell would not prevail against his Church (Matt. 16:18), meaning that it would never perish. But it would be ridiculous to promise that an invisible Church would not pass out of existence since some of the Church’s members are in heaven and Christ’s heavenly Church cannot pass away by its very nature. Only a visible, earthly communion needs a promise that it will never perish. There are thus abundant reasons to conclude that the Church Jesus was discussing in Matthew 16:17-19 was a visible communion of believers, and, since only the Catholic Church goes back that far, only it can be the one Christ founded. This leaves us with the fourth proposition — that to be a Catholic one must be subject to the Roman Pontiff. Two lines of evidence show this proposition. First, if one is a member of any formal organization, one is by nature subject to its leader (if it has one). The boundaries of formal organizations are established by who is united with the leader. If one is not in formal union with the leader, one is not a formal member of the organization. This holds regardless of the group in question. If one is not subject to the king, one is not a citizen of the kingdom. If one is not formally under the chairman, one is not a member of the committee. Since Jesus made Peter the leader of the Church, one who is a member of the Church is necessarily subject to the pope. Second, Jesus gave Peter the keys to the kingdom. Keys are used to open and close doors or gates through which people enter. Jesus thus gave Peter the power to admit and exclude from the Church. This power is often exercised in the name of the pope by his priests, who by baptism or profession of faith bring new members into the Church, but power is the pope’s. When one is admitted to the Church, it is by exercise of the keys of the kingdom. The keys also can potentially exclude one through excommunication. Both the gaining and loss of membership are functions of the power of the keys, which is held by the pope. Scripture thus shows that all four of the above propositions are true. It is normatively necessary for salvation to be subject to the pope. This is not because of any special quality of the pope himself, but because he is the leader Christ appointed for his Church, and because full membership in his Church is normatively necessary for being a Christian, which is normatively necessary for salvation. It is possible in some instances for a person to be saved without fulfilling these obligations. If a person is innocently ignorant of his obligation to join the Church then God will not hold this against him, but will make it possible for him to be saved anyway. One is innocently ignorant if he has not seen sufficient evidence for the truth of the Catholic faith (given his mental faculties and any opposing evidence he has been given by anti-Catholics). But if one has seen sufficient evidence, or if he has seen enough evidence that he should investigate further but has failed to do so, his ignorance is not innocent. Even for those who are innocently ignorant, salvation is not achieved without some union with the Church. As Catholic teaching makes clear, one can be united with the Church in a way that does not involve full incorporation into it. Only Catholics are fully incorporated, though non-Catholics who are in a state of grace are linked with it (to use Vatican II’s terminology), even if they are unaware of this. “Those who, through no fault of their own, do not know the Gospel of Christ or his Church, but who nevertheless seek God with a sincere heart, and, moved by grace, try in their actions to do his will as they know it through the dictates of their conscience — those too may achieve eternal salvation. Nor shall divine providence deny the assistance necessary for salvation to those who, without any fault of theirs, have not yet arrived at an explicit knowledge of God, and who, not without grace, strive to lead a good life. . . . But very often, deceived by the Evil One, men have become vain in their reasonings, have exchanged the truth of God for a lie and served the world rather than the Creator (cf. Rom. 1:21 and 25). Or else, living and dying in this world without God, they are exposed to ultimate despair. Hence, to procure the glory of God and the salvation of all these, the Church, mindful of the Lord’s command, ‘preach the Gospel to every creature’ (Mark 16:16) takes zealous care to foster the missions” (Lumen Gentium 16). Some radical traditionalists are not satisfied with the teaching of Vatican II and demand more proof that some who are not in formal union with the Church can be saved. We could cite the works of any number of popes prior to Vatican II to show this (for example, Pius IX’s allocution, Singulari Quadem, given the day after he defined the Immaculate Conception in 1854, or his 1863 encyclical Quanto Conficiamur Moerore, or Pius XII’s 1943 encyclical Mystici Corporis), but to make short work of the matter, let us look at an infallible definition from the Council of Trent, whose teachings were formulated in one of the most bitterly polemical and least ecumenical periods in history, and which to radical traditionalists is an absolutely unimpeachable source. Canon four of Trent’s “Canons on the Sacraments in General” states, “If anyone shall say that the sacraments of the New Law are not necessary for salvation but are superfluous, and that although all are not necessary for every individual, without them or without the desire of them . . . men obtain from God the grace of justification, let him be anathema [excommunicated].” This is an infallible statement because anathemas pronounced by ecumenical councils are recognized as infallibly defining the doctrine under discussion. Trent teaches that although not all the sacraments are necessary for salvation, the sacraments in general are necessary. Without them or the desire of them men cannot obtain the grace of justification, but with them or the desire of them men can be justified. The sacrament through which we initially receive justification is baptism. But since the canon teaches that we can be justified with the desire of the sacraments rather than the sacraments themselves, we can be justified with the desire for baptism rather than baptism itself. This is confirmed in chapter four of Trent’s Decree on Justification. This chapter defines justification as “a translation from that state in which man is born a child of the first Adam to the state of grace and of the ‘adoption of the sons’ of God through the second Adam, Jesus Christ, our Savior.” Justification thus includes the state of grace (salvation). The chapter then states that “this translation, after the promulgation of the gospel, cannot be effected except through the laver of regeneration or a desire for it, as it is written: ‘Unless a man be born again of water and the Holy Spirit, he cannot enter the kingdom of God’ [John 3:5].” Justification, and thus the state of grace, can be effected through the desire for baptism (for scriptural examples of baptism of desire, see Acts 10:44-48, also Luke 23:42-43). Only actual baptism makes one a formal member of the Church; baptism of desire does not do so. 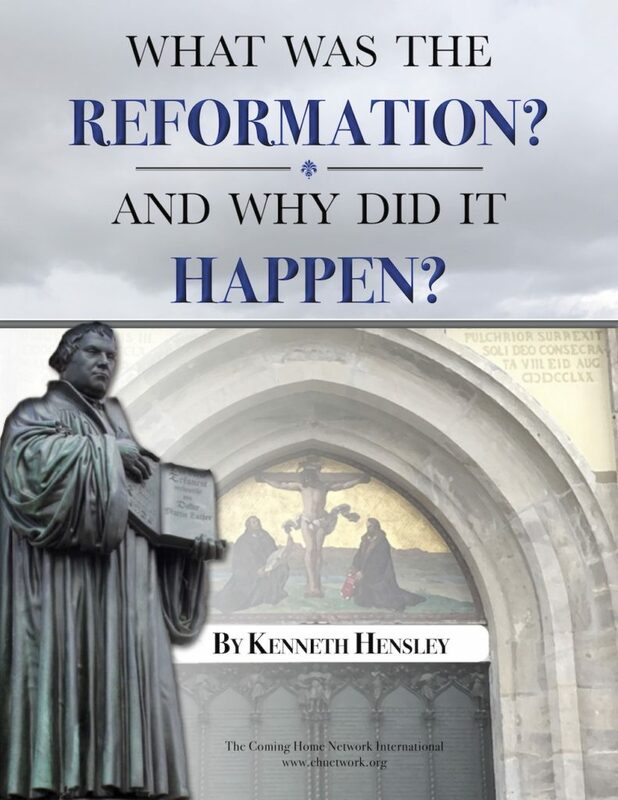 Since justification can be received by desire for baptism, as Trent states, justification and thus the state of grace can be received without formal membership in the Church. The desire for baptism is sufficient. Later Catholic teaching has clarified the nature of this desire and shown it can be either explicit or implicit. One has explicit desire for baptism if he consciously desires and resolves to be baptized (as with catechumens and others). One has an implicit desire if he would resolve to be baptized if he knew the truth about it. How does implicit desire work? Consider the following analogy: Suppose there is a person who is sick and needs a shot of penicillin to make him better. He tells his physician, “Doc, you’ve got to give me something to help me get well!” The doctor looks at his chart and says, “Oh, what you want is penicillin. That’s the right drug for you.” In this case the man had an explicit desire for a drug to make him better — whatever that drug might be — and the appropriate one was penicillin. He thus had an implicit desire for penicillin even if he had not heard of it before. Thus the doctor said: “What you want is penicillin.” This shows that it is possible to want something without knowing what it is. A person who has a desire to be saved and come to the truth, regardless of what that truth turns out to be, has an implicit desire for Catholicism and for the Catholic Church, because that is where truth and salvation are obtained. By resolving to pursue salvation and truth, he resolves to pursue the Catholic Church, even though he does not know that is what he is seeking. He thus implicitly longs to be a Catholic by explicitly longing and resolving to seek salvation and truth. Papal and conciliar writings in the last hundred years have clarified that those who are consciously non-Catholic in their theology may still have an overriding implicit desire for the truth and hence for Catholicism. Pope Pius XII stated that concerning some of “those who do not belong to the visible Body of the Catholic Church . . . by an unconscious desire and longing they have a certain relationship with the Mystical Body of the Redeemer” (Mystici Corporis 103). How does this work? Consider our example of the sick man who needs penicillin. Suppose that he thinks that a sulfa drug will cure him and he explicitly desires it. So he tells the doctor, “Doc, I’m real sick, and you’ve got to give me that sulfa drug to make me better.” But the doctor notices on his chart that he has an allergy to sulfa drugs, and says, “No, you don’t want that; what you really want is penicillin.” In this case the person’s primary desire is to get well; he has simply mistaken what will bring that about. Since his primary desire to be well, he implicitly desires whatever will cause that to happen. He thus implicitly desires the correct drug and will explicitly desire that drug as soon as he realizes the sulfa would not work. As papal and conciliar writings have indicated, the same thing is possible in religion. If a person’s primary desire is for salvation and truth then he implicitly desires Catholicism even if he is consciously mistaken about what will bring him salvation and truth. He might be a member of some other church, yet desire salvation and truth so much that he would instantly become a Catholic if he knew the truth concerning it. In this case, his primary desire would be for salvation and truth — wherever that might be found — rather than his primary desire being membership in a non-Catholic church. However, the situation could be reversed. It is possible for a person to have a stronger desire not to be a Catholic than to come to the truth. This would be the case when people resist evidence for the truth of Catholicism out of a desire to remain non-Catholic. In this case their primary desire would not be for the truth but for remaining a non-Catholic. Thus their ignorance of the truth would not be innocent (because they desired something else more than the truth), and it would constitute mortal sin. Even though some radical traditionalists are disobedient to the papal and conciliar documents which teach the possibility of implicit desire sufficing for salvation, the Church has still taught for centuries that formal membership in the Church is not an absolute necessity for salvation. This was the point made by Trent when it spoke of desire for baptism bringing justification. The issue of whether desire for baptism saves and the issue of whether that desire can be explicit or implicit are two separate subjects which radical traditionalists often confuse. If we keep them separate, it is extremely clear from the Church’s historic documents that formal membership in the Church is not necessary for salvation. To avoid this, some radical traditionalists have tried to drive a wedge between justification and salvation, arguing that while desire for baptism might justify one, it would not save one if one died without baptism. But this is shown to be false by numerous passages in Trent. In the same chapter that it states that desire for baptism justifies, Trent defines justification as “a translation . . . to the state of grace and of the adoption of the sons of God” (Decree on Justification 4). Since whoever is in a state of grace and adopted by God is in a state of salvation, desire for baptism saves. If one dies in the state of grace, one goes to heaven and receives eternal life. Thus desire for baptism brings justification and justification makes one an heir of life everlasting. If one dies in a state of justification, one will inherit eternal life. Period. This question of whether formal membership is necessary for salvation is thus definitively settled by Trent. It is not. Informal membership, the kind had by one with desire for baptism, suffices. “cannot obtain salvation, since neither sacramentally nor mentally are they incorporated in Christ, through whom alone can salvation be obtained. Secondly, the sacrament of baptism may be wanting to anyone in reality but not in desire: for instance, when a man wishes to be baptized, but by some ill-chance he is forestalled by death before receiving baptism. And such a man can obtain salvation without being actually baptized, on account of his desire for baptism, which desire is the outcome of ‘faith that worketh by charity’ [Gal. 5:6], whereby God, whose power is not tied to the visible sacraments, sanctifies man inwardly. Hence Ambrose says of Valentinian, who died while yet a catechumen: ‘I lost him whom I was to regenerate; but he did not lose the grace he prayed for'” (Summa Theologiae III:68:2, citing Ambrose, Sympathy at the Death of Valentinian [A.D. 392]). The question of whether desire for baptism needs to be explicit or implicit is a separate issue which was not raised by Trent, but which has been dealt with repeatedly by popes and councils since that time. Still, Trent alone shows that the statement in Unam Sanctam teaches a normative necessity for formal membership, not an absolute one. Those who desire but do not have baptism are not formally members of the Church, yet they are linked to the Church by their desire and can be saved. What is absolutely necessary for salvation is a salvific link to the body of Christ, not full incorporation into it. To use the terms Catholic theology has classically used, one can be a member of the Church by desire (in voto) rather than in actuality (in actu). “When we speak of within and without in relation to the Church, it is the position of the heart that we must consider, not that of the body . . . All who are within in heart are saved in the unity of the ark” (Baptism 5:28:39). “sacramentally [or] mentally . . . incorporated in Christ, through whom alone can salvation be obtained,” and that “a man can obtain salvation without being actually baptized, on account of his desire for baptism, which desire is the outcome of ‘faith that worketh by charity’ [Gal. 5:6], whereby God, whose power is not tied to the visible sacraments, sanctifies man inwardly” (ST III:68:2). What the radical traditionalists have forgotten is that they are not the interpreters of previous papal statements; the Magisterium is, and their personal interpretations may not go against the authoritative teaching of the current Magisterium. The idea that they can by private conscience interpret centuries-old papal decrees puts them in the same position as Protestants, interpreting centuries-old biblical documents. The radical traditionalist simply has a larger “Bible,” but the principle is the same: private interpretation rules! This completely defeats the purpose of having a Magisterium, which is to provide a contemporary source that can identify, clarify, and explain previous authoritative statements, whether from the Bible, Apostolic Tradition, or itself. Much of the current flap over Feeneyism could be avoided if conservative Catholics would remind themselves of the fact that it is the Magisterium, not them and their private judgment, which is the interpreter of previous Magisterial statements. The same is true of those who misuse papal and conciliar statements on the other side, privately interpreting them in a way — contrary to what they explicitly state — that all religions are equal, that every religion leads one to God, and that there is no need for evangelism. The Church teaches the exact opposite! While elements of truth may be found in other religions (for example, the truth that there is a supernatural world), elements of truth do not make equality in truth. Also, the mere presence of elements of truth does not mean a religion is leading one toward God. Though it is rare, full-blown Satanism contains elements of truth (there is a supernatural world, God exists, Satan exists, Satan is in rebellion against God, using consecrated Hosts in a Black Mass is offensive to God, etc. ), but this religion definitely does not lead one toward God! In fact, it can be the presence of elements of truth which make a counterfeit believable and lead one away from God. A lie is not credible if it bears no resemblance to reality, as illustrated by the serpent’s lie to Eve, which most definitely contained elements of truth — Adam and Eve did become “as God, knowing good and evil” (Gen. 3:5, 22) — but it was the believability of the serpent’s lie that led Adam and Eve away from God. So though it is possible for a person to be led toward God by elements of truth that are found in a false religion, this does nothing to diminish the need for evangelism. “very often, deceived by the Evil One, men have become vain in their reasonings, have exchanged the truth of God for a lie and served the world rather than the Creator (cf. Rom. 1:21 and 25). Or else, living and dying in this world without God, they are exposed to ultimate despair. Hence, to procure the glory of God and the salvation of all these, the Church, mindful of the Lord’s command, ‘preach the Gospel to every creature’ (Mark 16:15) takes zealous care to foster the missions” (Lumen Gentium 16). And Pope Pius XII stated concerning “those who do not belong to the visible Body of the Catholic Church . . . we ask each and every one of them to correspond to the interior movements of grace, and to seek to withdraw from that state in which they cannot be sure of their salvation. For even though by an unconscious desire and longing they have a certain relationship with the Mystical Body of the Redeemer, they still remain deprived of those many heavenly gifts and helps which can only be enjoyed in he Catholic Church. Therefore may they enter into Catholic unity and, joined with us in the one, organic Body of Jesus Christ, may they together with us run on to the one Head in the society of glorious love” (Mystici Corporis 103). These quotes show the Church’s insistence on people’s need to receive evangelization — to hear the good news — but most fundamentally evangelism is necessary because Christ calls us to dispel all ignorance concerning him and the means of salvation he has established (including the Church), for Christ commands, “Go therefore and make disciples of all nations, baptizing them in the name of the Father and of the Son and of the Holy Spirit, teaching them to observe all that I have commanded you” (Matt. 28:19-20). We are to dispel all ignorance, including innocent ignorance, for we are to “Go into all the world and preach the gospel to the whole creation” (Mark 16:15). Those who represent, even through silence, the Magisterium as not requiring and stressing the urgent need for world-wide evangelism are distorting the teaching of the magisterium as much as those who represent it as saying absolutely no one who is not formally a Catholic can be saved.